Isolated in Tanzania's far southwest corner, this little-visited park offers a genuine wilderness experience. The main focus for wildlife viewing is the Katuma River and floodplains. Seasonal lakes draw myriad waterbirds and Tanzania’s densest concentrations of hippo and crocodile. During the dry season, staggering numbers of animals converge on the shrunken river, with thousands of elephant, buffalo, giraffe, zebra and impala providing easy pickings for lion and hyena. Katavi is truly one of the most wild and remote parks in Africa, unique for its low number of visitors and vehicles combing the landscape for animals. There are only five small camps in this 1.1 million-acre sanctuary. Its removed location, far from the more frequented parks and reserves of northern Tanzania, is what makes Katavi so special for naturalists and animal lovers. Activities revolve around morning and afternoon wildlife drives to view large mammals and predators along the river system and floodplains. 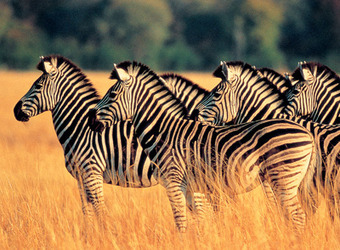 Safari walks with knowledgeable guides are an option; picnics in the bush can also be arranged. Birding in Katavi is excellent, especially when the rains move in around November. Fly camping beneath a clear, starry sky away from the main camps offers an even more palpable experience of the wilderness. This 1.1 million-acre national park has some of the largest elephant and Cape buffalo herds in Africa. 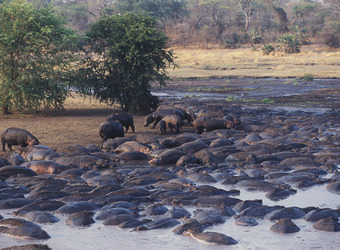 Masses of crocodile and hippo inhabit the pools of the Katuma River and the Chada and Katavi lakes. During the dry season the river dries up, revealing pods of hippo packed by the hundreds into the remaining mud holes along the river bed. Lion hunt buffalo, found in herds up to 2,000 strong, as well as hippo in the driest months. Elephant come into camp for the tamarind trees during the dry season from July to October. 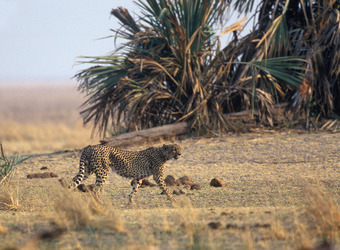 Wild dog and cheetah are occasionally found, and leopard, though elusive, are present. Migratory birds pass through around September, and the rainy season sees prolific bird life. Neighboring Rukwa, Lukwati and Luafi game reserves plus numerous surrounding forest reserves make this one of the largest and richest wildlife havens in Africa, more than six million acres, mostly free of human impact. Katavi with its great herds is a natural complement to Mahale Mountains National Park, where the key focus is chimpanzee viewing, in western Tanzania. The two areas are similarly remote and removed from the rest of Tanzania’s popular parks and reserves. Twice weekly flights connect Arusha to both of these isolated sanctuaries. 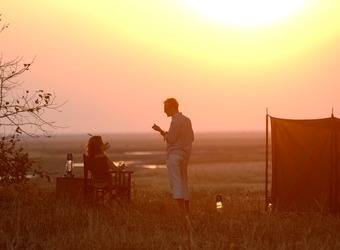 A circuit of rich wildlife areas can be created by visiting Ruaha National Park, Tanzania’s second largest, and Selous Game Reserve, both in the south of the country. These areas, like Katavi, are incredibly remote with few tourists and rich wildlife. Ending your safari in Zanzibar, with its white sand beaches and idyllic waters, endemic red colobus monkeys and spice trade history, is a perfect way to complete a well-rounded journey. When did you visit Katavi Nat'l Park?